A common misconception with beef, and especially ground meat, is that brown meat equates to old meat. 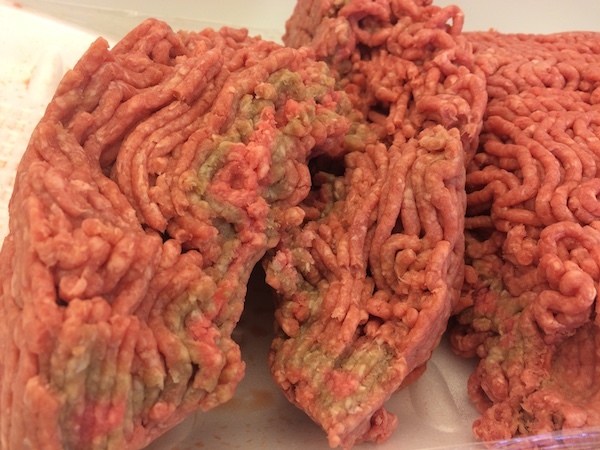 Although it is true that the absolute freshest ground beef possible, straight from the grinder, is red in color… a brown color in meat does not alone mean that the meat is old and unsafe. There are two other indicators of spoiled meat, one of which must also be present in order for brown meat to be considered spoiled. Is Brown Meat Spoiled Meat? Brown meat is not in itself an indication of spoiled meat. According to the USDA, if the meat is brown and no other symptoms of old meat exist it is OK to proceed with cooking the meat. If a brown color inside meat isn’t an indicator of spoiled meat, then what in fact is? Long story short, the protein in meat mixes with oxygen to produce the red color in meats (see the link in additional info below if interested in the full and complete story of meat color). Meat is wrapped in cellophane that oxygen can permeate. The external part of the meat will continue to produce the red color while the internal meat, due to a lack of oxygen making it to the center of the package, will begin to turn brown. The cellophane wrap used by supermarkets most everywhere is air permeable, which is why we always suggest re-wrapping meats in freezer safe materials before freezing them to prevent freezer burn. When meats sit in the grocers refrigerator oxygen can get through to the meat. But, when meat packages are stacked on top of each other, they are compressed and therefore no air gets through to the bottom layers causing them to turn brown before their time. If you prefer the look of red meat, which most of us do, then choose the top package of meat… although, there is no guarantee that that’s where the package spent its entire shelf life! The inside part of the meat turns brown first since air can’t penetrate through a layer of meat, but the outside layer will remain red as long it is still getting oxygen. When arriving home with a package of meat, be sure not to place anything on top of the beef package in the refrigerator. Whatever part of the beef that is covered will also turn brown. Once meat sits in the refrigerator for too long, beyond about five days, even the outside layer will begin to turn brown as enzyme activity naturally decreases over time and no longer mixes with oxygen to keep the bright red color. So, if you happen to open up a package of meat looking like the photo above (actually the photo isn’t bad at all, but showing completely brown meat just does not make for an appetizing picture) please don’t throw it away simply because of its color. Instead, make sure that one of the other spoilage indicators also exists before tossing good meat. After around five days of being chilled, the enzyme activity naturally decreases in meat and the brown color will begin to take over the remaining parts of the meat. This is then quickly followed by another indicator of spoiled meat as explained above and it is then time to toss the brown meat. For everything you’d ever want to know about meat color, see this article from the University of Saskatchewan. To find out how long beef lasts, check our beef page. To find out how long ground beef lasts, check our hamburg page. To find out the different types of ground beef available, check our beef grinds post.